May the solid brass urn contained in this locket hold the memories of your loved one, keeping them close to your heart and bringing you comfort. This message is included with this beautiful pewter heart that contains a small brass ash holder. 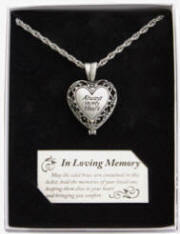 What a beautiful and sentimental memorial gift. 24 in. chain. Pendant is approximately 1 1/2 in. Gift boxed.